These Pumpkin Chocolate Chip Protein Muffins are made in a blender and are high protein & low carb, gluten free, and less than 120 calories. Make sure to check out the video below to see how easy they come together! It’s officially starting to feel like fall here in Austin! Wahoo!! I love how the mornings are cooler when you wake up. It feels so refreshing to get up and not be instantly sweating when you walk outside. Don’t get me wrong, I don’t want it to get too cold, but a break from the summer heat is nice. I used to hate fall growing up because I knew winter was just around the corner. It was nice for like 3 weeks and then all the sudden freezing. Now that we have been in Austin awhile, it is super nice for a change in the temperature from the summer. And you have quite a while till it actually gets cold and it’s no comparison to the northeast. You can actually do things outside and not be a miserable b*tch..or maybe that was just me? The freezing cold isn’t a good look for me. Trust me on that one. So since it is feeling like fall and all, you know what that means…PUMPKIN!! As if you haven’t already seen one million recipes from other food bloggers with pumpkin in them, I figured I would throw some more your way. On top of the ones I have already posted ha. Like these pancakes and energy balls. And there will probably more to come. These pumpkin chocolate chip protein muffins (say that 5 times fast) are super easy to make. Just throw everything into a Vitamix, blender, or food processor (minus the chocolate chips), process, fold in the chips, and voila. They are also packed with protein. I used Greek yogurt and whey protein, but feel free to substitute for a protein of your liking. If you don’t eat gluten, feel free to use gluten free oats. I feel like the recipe is pretty forgiving and making a few changes will still produce delicious results! Check out the video on how easy it comes together! Add the oats to a Vitamix, blender, or food processor and process until a flour forms (about 10 seconds). 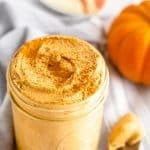 Add the pumpkin, Greek yogurt, eggs, protein powder, pumpkin pie spice, cinnamon, baking powder, and baking soda and blend again until well combined. Distribute into 12 silicon muffin liners (or regular muffin liners that are greased). *tip: Only stir in about 1/3 cup of the chocolate chips and then sprinkle the rest of them on the top of the muffins after they are in the liners. This makes for pretty muffins. **nutrition information is based on using whey protein. This recipe was previously posted and was updated this year with a video and photography! This post contains affiliate links and I may make little bit of money if you click on and purchase the products that are linked. It doesn’t cost you any extra money. The compensation helps with expenses to keep ETG up and running. I appreciate your support! Might be a silly questions but trying to count macros for this. Am I to take it as 18.3 grams of carbs or is sugar accounted in the 13? Hi Annie, definitely not a silly question! The sugars are accounted for in the grams of carbs, so the total carb count is 13 grams. Hope they turn out well for you! I’m allergic to dairy is there any good substitute for the yogurt? Hi Savi! You could try dairy free yogurt or canned coconut milk. I haven’t tried it with them, but they have similar consistencies so I think it would work. Let me know if you try it! Question! So I used my food scale to weigh out the ingredients and did 122 grams of pumpkin purée. When I looked at the nutrition facts, it said 122 g of pumpkin purée is only 1/2 cup…not a full cup. So just wanted clarification, should it be 1 cup or 1/2 cup? Can I substitute the oat flour for almond or coconut flour and if so, how much would I use? Hey Rachel, I haven’t tried either, but would recommend almond over coconut. Coconut is very absorbent and you wouldn’t need much of it at all. If you try almond, I would go for 3/4 cup. If the batter is too runny then add a little more. Hope that helps and let us know if they turn out! do they need to be refrigerated after baking?? could you replace the oats for almond flour? Hi Heather! I haven’t tried that, but you might be able to. I would think it would be a 1-1 sub, but maybe add less and then look at the consistency and add more if it is too thin. Let me know how it goes if you try! Could I substitute the 2 eggs for just egg whites? if so, how much should I use? I would think so. I would try about 1/3 cup. Let me know how it goes if you do! Made these for my kids for a quick on the go breakfast. Recipe is very forgiving. I used half regular yogurt and half sour cream (that’s what i had on hand). Kids thought they were great and I like that they will keep them full all morning and are not full of white flour and sugar. This one is a keeper. Thanks! Yay, so glad you liked them Susan! I find the recipe is forgiving too which I love. I like the idea of using sour cream! Thanks for trying them! Hello! Trying to create some make ahead protein packed snacks for a new momma friend of mine – would these freeze well??? 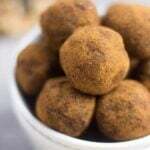 If not could you offer any suggestions of your favorite freezer friendly snacks, balls – ideal easy to reheat and go! Love these! One of my favorite go to snacks post workout! I have made these lots of times. So macro friendly too! So glad you like them Kristin! They are super customizable too, which I love. Thanks for trying them! Yes definitely!! I have used 4% fat yogurt as well. The nutrition/marco breakdown will probably just a little different. Can you omit the protein powder? Will that effect the mix of the ingredients? Yes, I would just add a little more oats when you are making the oat flour. Maybe 1/3-1/2 cup! Hope that helps Virginia! I am planning on making these very soon; they look yummy! Two questions, though – how do you think these would taste with chocolate protein powder (which is what I have on hand)? Also, would adding ground flaxseed to boost the protein even more throw off the texture of the muffins? Hey Audrey! Yes, chocolate protein powder would be delicious! I haven’t tried adding flax, but I think it might throw off the texture a little. If you do add it, it absorbs a decent amount of liquid, so you might have to add a little more liquid (more yogurt or maybe a splash of almond milk). Let me know how they turn out! Hi! I’m wondering what a serving size is, is it a few of the muffins? They taste wonderful. Hey Lisa! The nutrition breakdown is per one muffin! Glad you like them! Can you clarify scoops of protein powder? Where I am I can get this stuff in bulk food store, so I don’t have a scoop that came with the powder. Do you have an approx measurement. Hi Helen! Yes – it is about a heaping 1/3 of a cup. The recipe is pretty forgiving, so it doesn’t have to be exact, but close to that amount. I have used plant based protein powder and whey and both work. Hope that helps!